So, I took the Rebel on a ride and it was really dusty. powder dust. I figured I would check the Air filter to make sure it did it's job. 1st off, What a pain to get to the Air box on the 4 seater. 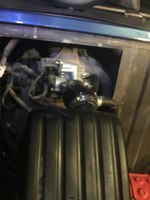 The intake is toward the cab. Had to pull 1 of the back seats and then the rear center console to get to it. 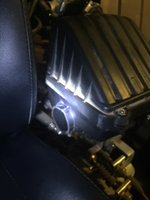 When I got the console off, I was supprised to see the air box directly connected to the engine with just a hole on the intake side of the Air box. Looked like someone took a hack saw to it so it would fit under that console. I pulled the box and the filter. The filter had TONS of dust/dirt on it, but did it's job and I could not see any dust on the engine side of the filter. Needless to say, I need to rethink this intake. 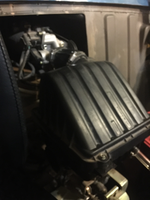 reroute it or see if I can get an elbow to fit the side to go back to somewhere easier to get to and put in a pre-filter to maintain instead of always having to access the air box. I guess I am going to try to move the box enough to get an elbow on the intake side . Then I was thinking I would take it back and into a Y pipe to split it off to the square plates on either side of the engine cover behind the back seats. 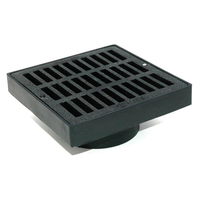 Then put something like this 6x6 drain/grate in place of those square plates with prefilter in each. I need to measure those square plastic covers to see what size they are. So, dual intakes with prefilter into one and into the original airbox. put a K&N filter in there. I can get a sheet of dual UNI filter material 12X24 for a bit over $20 and could cut it into many prefilters and keep some oiled in a plastic ziplock and could change them on the trail if needed with just a screwdriver. I hope this makes sense. any thoughts? Interested in what you come up with. Moving my filter is a must. Sounds like a good plan and going to a prefilter like what you mention is a must. I use the same UNI style prefilter material lightly oiled and my K&N is as clean as new after some 20K miles of all kinds of dusty dirty conditions. Seems like going dual prefilter will give more surface area to trap more dust which is a good thing. Two very important needs for an engine, good fuel and clean air. 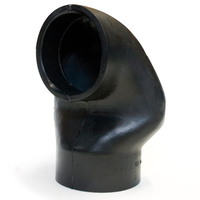 ok, I have been looking for a tight 90 to be able to connect to the Stock air box. 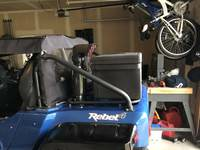 with the small amount of room between the air box and cover between the back seats, it has been hard locally. I found this on line and will try it out. It is 3" on both ends, but I can get a 2.5" insert from the same place to fit the airbox outlet. I think this will fit the stock airbox with room to clear the back center cover between the seats. it is a bit thicker and should not crush. I can then add a 3" pipe to it and then connector with the Y and the flex hose and 2 of the drains I showed above to finish it off with the oiled Uni filter material in them. Since I wanted to drive it, and I will be waiting for parts. while it was apart, I put in a K&N filter and sealed the box. I put a temporary cap on the intake with a hole cut in it and a SLP screen filter on the cap to stop some dust before getting to the filter. SLP sells round self stick screen that fit. I had it from when I had snowmobiles. I also put in new NGK plugs. I can feel the difference with thos changes. As I get parts (hopefully the elbow will fit) and start to put it together, I will add pictures. sorry, the round prefilter material I used was from Frogskins. Have not been in for some time and forgot I created this post. I finished the intake I was working on for the R4. Here are a couple of general external pictures I had with me. I will add more in a bit. 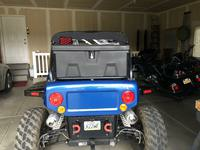 I found a snorkel and an inline air filter and some other parts to put it together. It is working well. I put some mesh in the snorkel and bought some pre-filter material and have like 4 made that are pre-oiled. I just replace them on the trail as needed to keep it clean. only 2 screws on the snorkel to change it out.